Nicaragua has launched legal action against Colombia in the International Court of Justice, claiming potentially oil-rich areas in the Caribbean. Last year the court in The Hague ruled that a group of small islands belonged to Colombia, but expanded disputed maritime limits in favour of Nicaragua. In the new case, Nicaragua asked the court to rule on the exact boundary. Colombia rejected the earlier ruling, and denounced the "unfounded pretensions of Nicaragua". Colombian President Juan Manuel Santos says the ruling "cannot be implemented" as new international borders can only be fixed by bilateral accords. 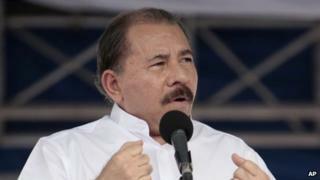 In an statement issued on Monday, Nicaraguan President Daniel Ortega says the possibility of bilateral talks on the dispute were "put off by Colombia's reaction" to the ICJ ruling. In the new case, Nicaragua requests an expansion on the borders fixed last year by the court, and "beyond its 200 nautical miles". The ICJ ruled last November that the San Andres archipelago, which includes three islands and several uninhabited islets, would remain with Colombia. But most of the sea around it would become Nicaragua's economic zone. The decision was celebrated in Nicaragua at the time. "The court has given to Nicaragua what belonged to us: thousands of kilometres of natural resources," said Mr Ortega. Last month, Nicaragua announced it would begin drilling for oil and gas in the area. The Central American nation calculates its territorial waters have been expanded by some 90,000 sq km (35,000 sq miles), while Colombia says what it would have lost amounts to 75,000 sq km (29,000 sq miles). Other countries in the region are taking sides in the dispute. Panamanian President Ricardo Martinelli accused Nicaragua of encroaching on his country's territorial sea. Mr Martinelli said he would sign a letter with Colombia, Costa Rica and Jamaica denouncing Nicaragua's attitude to UN Secretary General Ban Ki-moon. The long-running case has been before the ICJ since December 2001, when Nicaragua first filed its claim. But the dispute goes back much further. The competing claims date from the early 19th Century, when the nations of Latin America were gaining their independence from Spain. Nicaragua and Colombia signed a treaty in 1928 to settle the border and sovereignty of islands in the Caribbean. But in 1980, Nicaragua's Sandinista government unilaterally annulled the agreement, arguing that it had been signed under US pressure. In 2007, the ICJ ruled that the treaty was valid and that the sovereignty of three islands, San Andres, Providencia and Santa Catalina, remained with Colombia. The archipelago lies some 775km (480 miles) from the Colombian coast and 230km from Nicaragua.